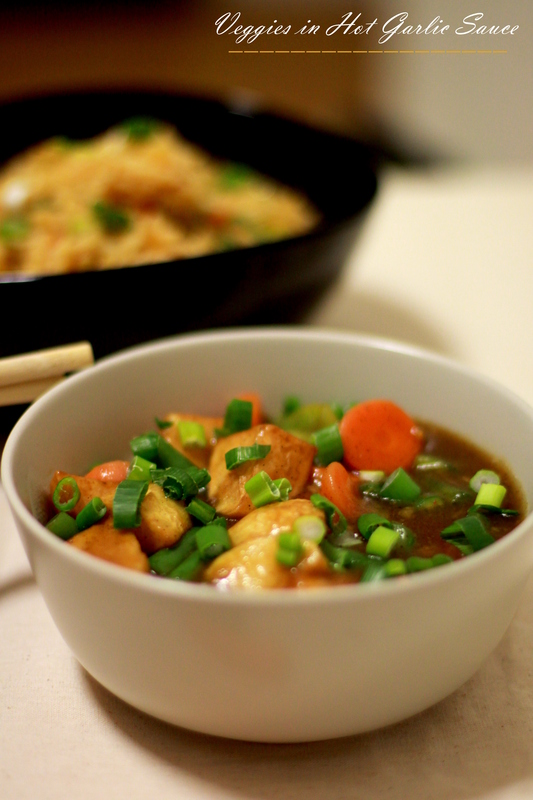 No doubt, I love Indo-Chinese food… But all what I usually make is Dry Manchurian, Fried Rice or Hakka Noodles! Last time, when I planned Mock Orange Chicken, I thought of making something else to go with it :) And here I’m with this gravy preparation that worked perfect way with my bowl of fried rice. Wash, peel and deep-fry potato until golden brown. Parboil green beans (cut into 2-3) and carrot cubes in salted water. Cut button mushrooms into halves. Heat oil in a wok and add garlic, ginger, red chilly paste, spring onion whites and brown onions into it. Saute on high heat for a min and add mushrooms, soy sauce and red chilly sauce in it. Toss it quickly. Add vegetable stock, lemon juice and seasonings to it. Once it comes to boil, add processed veggies along with cornstarch slurry (with 2 tbsp water). Mix everything quickly on high heat and let it get cooked for a few mins or until sauce starts thickening. 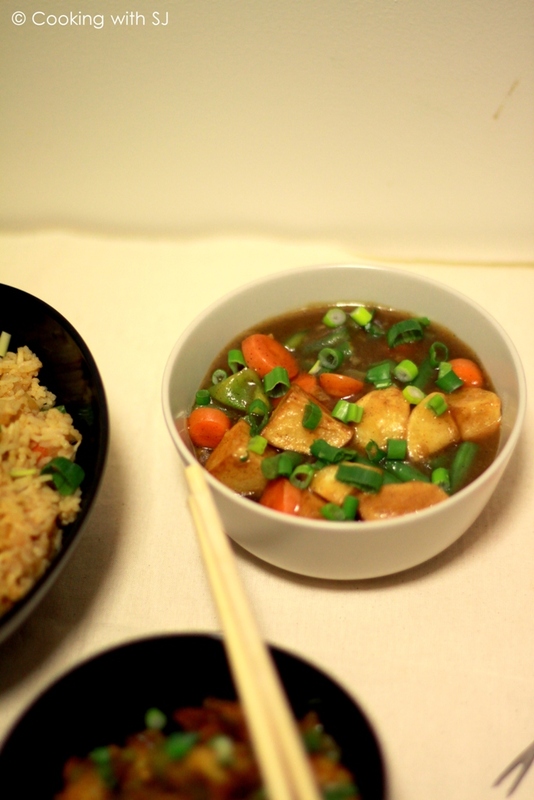 Garnish with spring onion greens and serve hot with fried rice! You can use seasonal vegetables of your choice! If sesame oil is not available, you can use regular one too. I like cooking it in olive oil as well. You know that I am an Indo Chinese fan too and a big one ;). Love it all. Can finish all by myself. Looks so inviting.. feel like grabbing it right away.. I am a huge fan on indo Chinese version…just love this….yum yum..